Thyroid, Parathyroid, Adrenal, Endocrine Surgery, What type of operations can be performed? Either one (unilateral) or both (bilateral) adrenals can be removed, the decision depending on which glands are affected and what is the underlying problem. The operation of choice for adrenalectomy is now laparoscopic or keyhole (minimally invasive) surgery. The approaches for the right and left adrenalectomy differ in detail (explained later) but in essence there are four main types of operation. This is "key-hole surgery". 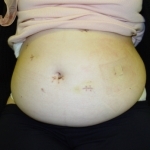 Rather than large incisions being made, a few (3-5) small holes are made in the abdomen of the patient through which a camera and surgical instruments are introduced. This reduces patients' pain and recovery time post-operatively and can be used for most tumours encountered in the adrenal gland except very large or malignant tumours. 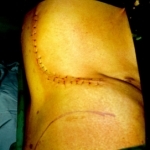 It is a difficult technique and should only be performed by surgeons who have undergone appropriate training in the operation. The advantage of the laparoscopic approach is that there is less scarring and quicker recovery after surgery. It is also probably a safer operation in phaeochromocytoma in experienced hands as there is less manipulation of the tumour before clipping of the vein and removal compared with the open approaches. The adrenal glands are accessed from the front of the patient via an incision just underneath the ribs. This approach is used when the tumour is suspected to be malignant as it exposes a greater area and provides good access to the gland and surrounding structures. A more radical version of the anterior approach, where parts of the thoracic (chest) cavity are exposed. This provides the greatest access when removal of surrounding tissues as a single block may be needed (e.g. where malignant cancers are very large, 10-15 cm, and may have spread). Incision is made on the back of the patient. It involves injury to fewer tissues improving the patient's recovery time with less pain and better post-operative bowel function than the anterior approach. It can only be used for small tumours however, where diagnosis by radiology has confidently excluded malignancy. Although the least traumatic of the three open operations, it has largely been superseded by the laparoscopic approach. Possible problems include bleeding, surgical-wound infection, adrenal-hormone shortage, fluid retention and increased risk of infections. However, serious problems are rare and patients can expect complete healing without complications. If the operation has been done with the laparoscope most patients have recovered in two to three weeks, allowing for the fact that hormone recovery can take longer, particularly in the case of cortisol-secreting tumours. 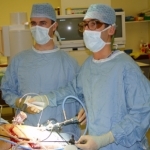 If the operation has been done by an open approach you must allow about six weeks for recovery from surgery. What is the average length of hospital stay after adrenalectomy? The average length of a hospital stay after an open adrenalectomy is about 7 days, but laparoscopic surgery has led to a 2-3 day stay postoperatively, depending on the type of tumour removed.